1. Physical Education Department of Zhejiang College of Sports, 49 Jiaogong Road, Hangzhou, Zhejiang Province, China. 310012. 2. Shanghai University of Sport, 200 Hengren Road, Shanghai, China 200438. 3. Department of Kinesiology at Valparaiso University, 1009 Union Street, Valparaiso, IN46383, U.S.A.
Visfatin is a recently discovered adipokine that contributes to glucose and obesity-related conditions. This study investigates Visfatin RS4730153 polymorphism from the perspectives of its relations with glucose/lipid metabolism and its influence on the effects of exercise-induced weight loss. Eighty-eight obese Han Chinese children and adolescents were randomly selected from a 2008 Shanghai Weight Loss Summer Camp and were supervised to complete a 4 week aerobic exercise training program. Significant differences were observed in before-exercise TG value and exercise-induced HOMA-β change, with the AG group having a much higher TG value than the GG group (P ≤ 0.05), and the latter exhibiting a significantly larger before-and-after exercise HOMA-β change than the former (P ≤ 0.05). However, no significant difference was observed between the two groups in before exercise indices of body shape, function and quality, nor in exercise-induced changes of body shape, function, and quality. Findings suggest that Visfatin RS4730153 homozygous GG genotype may effect adjustment of glucose and lipid metabolism in obese children and adolescents by reducing TG levels and increasing insulin sensitivity to exercise. Keywords: Visfatin, Polymorphism, Exercise, Weight loss, Obese children and adolescents, Glucose and lipid metabolism. The human Visfatin gene is located on the long arm of chromosome from 7q22.1 to 7q31.33, encoding a polypeptide of 491 amino acids with a molecular mass of 52 kDa  (National Center for Biotechnology Information accession number AAA17884) and all the splice junction sequences of its 11 exons and 10 introns conform to the AG/TG rule. According to a genome-wide obese gene scan of 6849 obese adults from 4 races (white, black, Mexican-Americans and Asian Americans) , chromosome 7q contributes to BMI (body mass index) and is susceptible to obesity. Among the 52 Visfatin single nucleotide polymorphisms (SNPs) discovered, some are found to be associated with obesity-related conditions and glucose/lipid metabolism . Furthermore, many beneficial physiological responses to aerobic exercise training in obese people, including improvements in glucose tolerance and insulin sensitivity, are revealed to be linked with changes of Visfatin concentration . Accordingly, Visfatin may be a candidate gene for aerobic exercise training-induced changes in glucose and obesity-related phenotypes and its gene polymorphisms may be the causes of differences in the response to identical exercises. Two Visaftins, SNPs rs4730153 and G-948T, are recognized for their linkage disequilibrium groups . While the latter is confirmed to be related with glucose/lipid metabolism and obesity-related conditions, results of researches on the former vary. As environmental factors could have a great impact on phenotypes of certain genes and may even mask the effects of genes on complex phenotypes, it is of greater value to study gene polymorphism via children and adolescents than adults, who are usually more affected by complicated factors such as treatment history and comorbidities. However, do Visfatin polymorphisms influence exercise-induced changes in glucose/lipid metabolism and other obesity-related indicators in obese children and adolescents? If yes, does the influence result from different degrees of sensitivity to exercise caused by different alleles? To the best of the authors' knowledge, there is no study on these topics. This study investigates Visfatin RS4730153 polymorphism's relations with glucose/lipid metabolism and its potential involvement in the response of exercise-induced weight loss in obese Han Chinese children and adolescents. Eighty-eight obese Han Chinese children and adolescents in southeast China were randomly selected from 2008 Shanghai Weight Loss Summer Camp. The average age of the subjects was 14.11±3.63yrs with 40 boys aging 13.21±3.01yrs and 48 girls 14.88±3.96yrs and the average BMI (body mass index) was 29.26±4.44. All subjects were sedentary outside compulsory exercise in schools. Subjects were screened by a professional physical examination and medical history investigation to exclude those with major health issues or medication usage. The study was approved by the Ethics Committee of Shanghai University of Sport and all parents and children presented their written consent of involvement in it. All subjects were identified for Visfatin genotype and assessed for pre-exercise conditions after a two-day unified dietary adaptation. Items assessed include fasting blood testing, body shape, physical quality and function. Post exercise assessment was conducted the next morning after the 4-week aerobic exercise training (about 18~20h interval to avoid the influence of acute exercise on metabolism). Customized 4-week aerobic training plans were designed according to an incremental exercise test of running on a flat treadmill at three separate speeds (4km/h, 6km/h and 8km/h), 2 minutes at each. All plans consist of two 120-min training sessions on week days and each includes a warm-up, aerobic exercise at an intensity of 20-40% of heart rate reserve (HRR) and a cool down. Exercise intensity was monitored with a polar real time system recording heart rates (Polar, Finland). Exercise routines were systematic and simple ones such as brisk walking, jogging, swimming, and ball games etc. Glucose and lipid metabolism were measured via Hitachi 7600-020 clinical analyzer. Insulin sensitivity was evaluated by ISI = 1/FPG × FINS and HOMA-IR = FPG × FINS/22.5  ; HOMA-β = 20 × FINS / (FPG-3.5) was used as an indicator of basal insulin secretion. Body shape, physical quality and function were assesses with standard measurement and waist-to-hip ratio (WHR) was calculated accordingly. Genotyping of Visfatin RS4730153 polymorphisms were done via ligase detection-polymerase chain reaction (LDR-PCR). Total DNA was extracted by AxyPrep-96 (AXYGEN) genomic DNA extraction kit. Primers were Forward 5'TCCCCCAAGCTGTTATGGTA3' and Reverse 5'AAGGTATGGTTGACCCAGCTA3' and the PCR was around 200bp. Primers and probes were diluted in TE buffer to 50pmol/ul according to the molecular weight. LDR was in 10ul system. Reaction program was 95 ℃ 2m → 94 ℃ 30s → 50 ℃ 2m. PCR products were sequenced by ABI PRISM 377 DNA Sequencer. Polymorphisms were analyzed by Gene mapper software. Descriptive data are presented as means± standard deviations and analyzed via SPSS (version 16.0) software. Before statistical analysis, data were tested for homogeneity. Data with variations on standard deviation were transformed to log values before further analyzed. Chi square t was used to assess Hardy-Weinberg genetic equilibrium. The before and after metabolic and physical indicators were analyzed by Paired t-test and independent t-tests were used to compare baseline and post aerobic exercise training differences in genotypes. Linear regression models adjusted for potential covariates such as age and gender were applied to test for association of the variant with quantitative phenotypes. Results of Polyacrylamide gel electrophoresis sequencing showed that genotype frequencies for the Visfatin RS4730153 polymorphism were 15.9% AG (8 boys and 6 girls) and 84.1% GG. The A allele frequency was approximately 8%, which was lower than previously reported (48% ; 41.6% ). However, the genotype frequencies were in Hardy-Weinberg equilibrium by χ2 (Table 1) (χ2 =1.037, df =2, P=. 595). a. 2 cells (33.3%) have an expected count less than 5.The minimum expected count is .50. Linear regression models with baseline characteristic values as covariates were used to compare characteristic changes between different genotypes. MI and WHR values were converted to logarithms before analyzed. Data in Table 2 show significant improvements in physical fitness parameters and glucose/lipid metabolic indicators after exercise (p≤0.01), which may indicate that the exercise intervention had an apparent effect on weight loss. According to the above table, there was no significant difference between the two groups in before exercise indices of body shape, function and quality. As to exercise-induced changes, the only differences lie in a significantly higher increase in R-grip and a slight improvement of L-grip in AG group. According to R-grip with p=.091 and L-grip .180 in 4730153AG and R-grip p=.012 and L-grip .000 in gender, we found it is gender rather than genotype that caused differences in the grip changes. Table 5 show a significantly higher before-exercise TG value in AG group (P ≤ 0.05, also shown in Figure 1). Also, it reveals a significant difference in HOMA-β changes between the two groups, with GG group exhibiting a significantly greater change than AG (p ≤0.05). The differences remained even after applying linear regression models with age and gender as covariates (P=0.048 and .038 respectively, Table 6). Although the difference in insulin level was not significant, a greater decrease in GG group was observed. No significant difference was observed in exercise-induced changes in the other metabolic indicators between the two. Effect of the Visfatin RS4730153 Variant on Basline TG. **means P ≤0.01, compared with baseline. 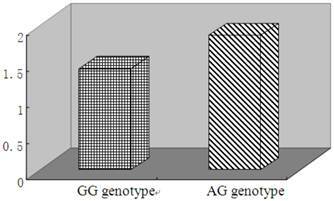 Before-and-after exercise body Shape, function and quality grouped by genotypes. *means P ≤0.05, compared with changes in indices with GG Genotype. Linear Regression Model for grip changes with age and gender as covariates. Before-and-after exercise glucose/lipid metabolism indices grouped by genotypes. #means P ≤0.05, Compared with before-exercise index with GG Genotype. Linear Regression Model for TG basline and HOMA-β changes with age and gender as covariates. The A allele frequency in this study was approximately 8%, which was lower than previously reported (48% ; 41.6% ). Difference in race may be one explanation for this discrepancy. The subjects in Bottcher et al. and in Johansson et al. were German and Swedish white Scandinavian populations respectively, whereas in this present study, subjects were from a Han Chinese population. Another possible explanation for dissimilar results may be the difference in subjects' age. The two studies on obese adults of Scandinavian origin had average ages of 59  and 42  respectively, however this present study examined children at an average age of 14. Additionally, inconsistency in results may be caused by differences in gene typing techniques. While the two previous studies applied TaqMan allelic discrimination, ligase detection-polymerase chain reaction (LDR-PCR) is used in the present study. Serum Visfatin concentration is negatively correlated with HDL while positively correlated with serum TG in obese populations . This may indicate a dyslipidemia caused by abnormal insulin sensitivity in obese people (higher TG levels and lower HDL levels). The significant genotype effect for baseline TG revealed by this study suggests that Visfatin RS4730153 polymorphism is likely to contribute to lipid metabolic malfunction and GG genotype may decrease the risk of dyslipidemia (Table 5). The results presented here therefore disagree with two previous studies   in which no correlation between lipid phenotype metabolism and Visfatin RS4730153 polymorphism was indicated. This may be caused by the differences in subjects. Compared with obese adult subjects , children and adolescents in this study are subject to less environmental influence and medical treatments, assuring greater accuracy of the results. At the same time, differences in race, gene typing techniques, and control of dietary and physical activity, which was not mentioned in another study , may also result in the disparity. This is the first study that indicates Visfatin polymorphism's involvement in the regulation of lipid metabolism. However, no significant differences for baseline insulin, glucose level and physical variables were found between Visfatin RS4730153 genotype groups and this is consistent with previous studies. The effect of exercise intervention on Visfatin level has been shown in both human    and animal models . The significant improvements in body shape, physical functions and quality, and the changed in post exercise glucose/lipid metabolism revealed in this study demonstrate that 4 weeks' aerobic exercise is an effective approach to combating overweight and other obesity-related conditions. Despite of the decrease in HDL, the HDL/LDL ratio (a more accurate predictor of coronary artery disease (CAD) ) increased significantly after exercise. Compared with studies by Reinehr, et al  which observed an exercise-induced weight loss program for one year, shorter program duration and sedentary population chosen for this study may partly explain the decrease in HDL levels. According to Table 5, the GG group showed a more significant change in exercise-induced HOMA-β and a larger decrease in insulin levels. Combined with the substantial decrease in HOMA-IR after exercise, it might indicate that Visfatin rs4730153 GG genotype could possibly improve glucose metabolism in obese children and adolescents by enhancing insulin sensitivity to exercise. However, the mechanism of the change is yet to be studied. No previous study has investigated the influence of Visfatin rs4730153 polymorphisms on the response of physical function and quality variables to aerobic exercise training. This study found that the AG genotype group had a significantly higher increase in grip strength than the GG (shown in Table 3). While various factors may influence an increase in grip strength; this study indicated that it is gender rather than genotype that causes the difference (Table 4). Visfatin single nucleotide polymorphisms at RS4730153 locus exists in obese Han Chinese children and adolescents. Visfatin RS4730153 polymorphisms are related to obesity and disorders of glucose and lipid metabolism. Homozygous GG genotype may adjust glucose and lipid metabolism in obese children and adolescents by reducing TG levels in baseline and increasing insulin sensitivity to exercise. This study was funded by the National Science and Technology Support Project “Research on Key Technologies of Chinese National Movement Guidance and Evaluation of Health Science”. The authors are especially grateful to the study participants. All authors were involved in the experiment and thesis writing and had final approval of the submitted and published versions. Corresponding author: Aiping Lai, Physical Education Department of Zhejiang College of Sports, 49 Jiaogong Road, Hangzhou, Zhejiang Province, China 310012. Email: lap810com. Tel: 86-138-58028336; Fax: 86-571-89932509.